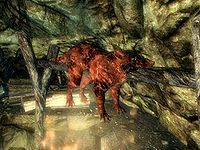 Skyrim contains many passive creatures, creatures that are completely unable to attack or harm you. Technically, these are not even true creatures, but are more similar to scenery: animated effects that can be activated (typically yielding an ingredient or food), but have no other activities. Fish can be found in most large bodies of water. Look for insects flying above the water to find fish below. 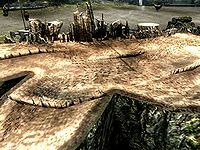 Several species can be farmed with Hearthfire by using the Windstad Manor fish hatchery. The following fish yield items of the same name unless otherwise noted. Abacean Longfins [sic] yield Abecean longfins, an alchemy ingredient. 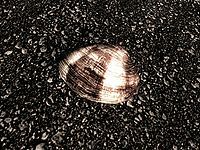 Clams yield clam meat, which is food, not an ingredient. 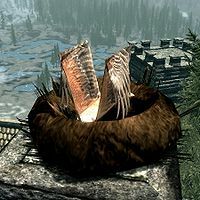 In the base game, it can only be eaten raw, unlike other raw food in Skyrim which can be cooked. 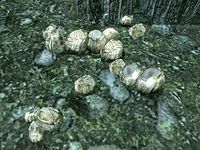 However, with the Hearthfire add-on, clam meat is one of four items needed to cook clam chowder. They are most commonly found in the Sea of Ghosts. Cyrodilic Spadetails yield Cyrodilic spadetails, an alchemy ingredient. Histcarp yield histcarp, an alchemy ingredient. Nordic Barnacle Clusters yield Nordic barnacles. 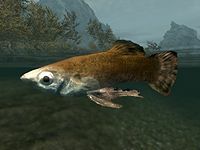 You can find them everywhere in Skyrim but especially in Lake Honrich, Lake Ilinalta and in all icy waters in the north of Skyrim. Pearl Oysters yield pearls and small pearls, which are ingredients. 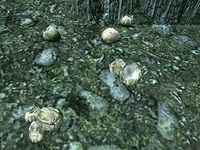 Pearl oysters only appear on the island of Solstheim and can be found along most of its shoreline. 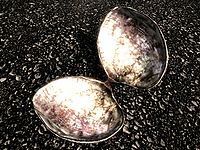 Pearl oysters are visually different from clams in that they are more gray-colored, while clams are more brown. River Betties yield river betties, an alchemy ingredient. 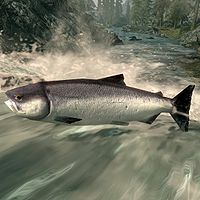 Salmon are found swimming in the rivers and seas of Skyrim and are often seen jumping out of the water to ascend waterfalls and rapids. Catching salmon yields salmon meat which is food, not an alchemical ingredient, as all other species of fish are. 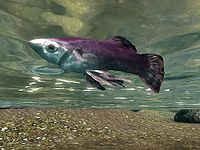 While the other species of fish tend to swim near the surface of bodies of water, salmon may be seen either near the surface or in the depths. 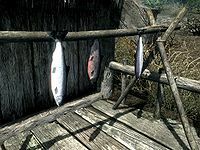 Salmon may be shot with an arrow (or killed with various shouts) to make them easier to catch, then collected by using the action key. However, the prompt to do so may not come up. 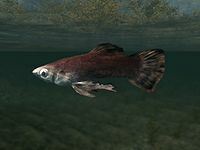 With the Hearthfire add-on installed, salmon roe may be harvested from leaping salmon found in streams, or swimming salmon the player kills, but not from pre-existing dead salmon. Silverside Perch yield silverside perch, an alchemy ingredient. 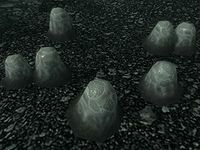 Slaughterfish Egg Nests yield slaughterfish eggs. 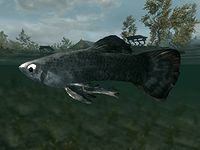 Note that slaughterfish themselves are hostile creatures, and are documented elsewhere. These animals are found dead, usually hanging upside down near a fire or in the wilderness. 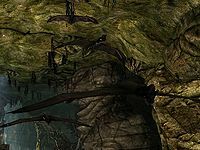 Charred Skeevers are found around bonfires, typically in bandit camps or giant camps. 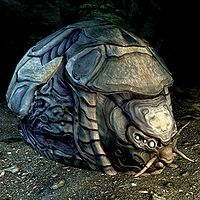 They yield charred skeever hide when activated. 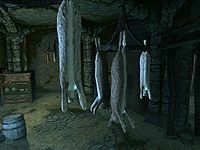 A hanging horker can be found in Skaal Village. It yields three samples of horker meat. 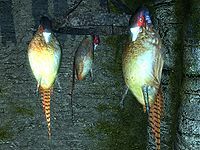 Hanging pheasants yield pheasant breasts. Hanging rabbits yield raw rabbit legs. Live rabbits are non-hostile creatures, and are documented elsewhere. Hanging salmon, just like live salmon, yields salmon meat. 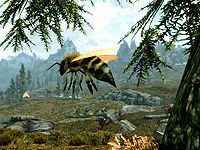 Despite their small size, insects are capable of pushing you and other NPCs around. 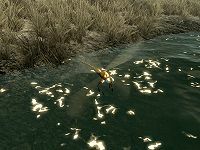 Harvesting is also possible by using melee attacks, ranged attacks, or Unrelenting Force on the target insect. Ingredients must then be collected from the ground. 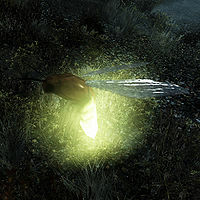 Ancestor Moths are added by the Dawnguard add-on, and can be harvested to yield ancestor moth wings. 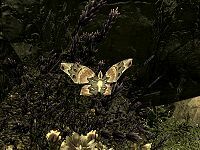 Several swarms can be found in Ancestor Glade, however they are not lootable; you must find the moths that land on the flora instead. Ants can be found crossing tree stumps (such as one at Half-Moon Mill, next to the grindstone) in large numbers. They cannot be interacted with in any way, and are purely aesthetic. Bees are found in and around their beehives, usually hanging in trees. Beehives can be harvested to yield bees, beehive husks, and honeycomb. Vacant beehives will only yield bees and beehive husks. 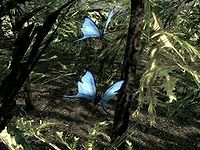 Blue Butterflies can be found during the day; each insect yields two blue butterfly wings. Dragonflies yield blue dartwings or orange dartwings. 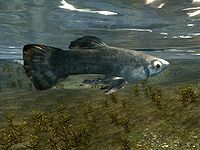 They can be found during the day, often over water. Luna Moths can be found at night; each insect yields two luna moth wings. Monarch Butterflies can be found during the day; each insect yields two butterfly wings. Torchbugs can be found at night; each insect yields a torchbug thorax. Bats are found flying in caves and dungeons, traveling in groups. They are a visual effect of no significance to gameplay other than adding ambiance. Vampire LordsDG can transform into a cloud of bats, or use bats to attack enemies in combat. Flocks of birds can sometimes be seen fleeing from treetops when disturbed. They are a visual effect of no significance to gameplay other than adding ambiance. 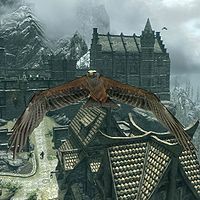 Bone Hawks are variants of hawks that are added by the Dawnguard add-on and are found flying around Castle Volkihar. Their body is similar to a regular hawk's, but their head is an exposed skull and their bodies are darker. When shot down, they yield one bone hawk claw, two bone hawk feathers and one bone hawk skull. Bone hawks can be killed only once. Once they respawn, they become invincible. 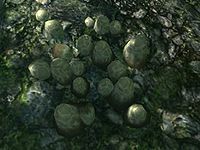 Egg Sacs are found in dungeons and can be harvested to yield chaurus eggs. There are also frostbite spider egg sacs (displayed as singular "Egg Sac"), but these are containers rather than activators. 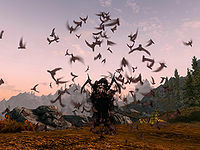 Felsaad Terns are variants of hawks that are added by the Dragonborn add-on and are found flying around Solstheim. Their body is similar to a regular hawk's, but with white feathers. When shot down, they yield one to three Felsaad tern feathers. 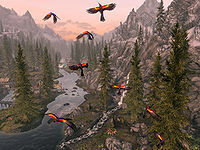 Hawks are birds that can be seen flying around Skyrim. They can be shot down, yielding hawk beaks and hawk feathers; those pages provide details on where hawks can be found. 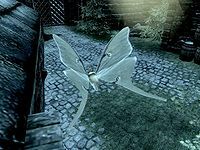 They can be killed with magic (including non-damaging spells like Courage), a few shouts (Animal Allegiance, Soul Tear, and Kyne's Peace), or shot with an arrow, although this may fling out of sight, as they are very light. If the body flies too far the arrow can detach from the body and instead fly up into the sky. Hawks will have a nest nearby that they return to from time to time. A good strategy is to attack hawks when they are in their nests using a low power spell such as Flames, rather than Fireballs or arrows, to keep their bodies from being flung out of sight. Hawks can be killed only once. Once they respawn, they become invincible. Shellbugs are rare creatures that can't be killed with conventional methods, and are the source of the rare shellbug chitin. 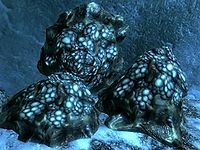 To obtain the chitin you need to mine it from the creature with a pickaxe; doing so will result in its death when fully mined. They can be found in Forgotten Vale Cave and Sharpslope Cave. 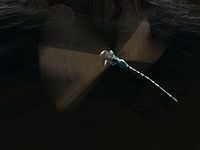 Silt Striders are giant arthropods often used by the Dunmer of Morrowind as transportation within their hollow shells. 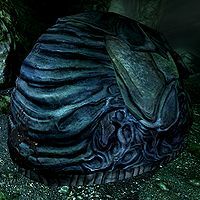 One, named Dusty, has been added by the Dragonborn add-on, and can be found on Solstheim in the outskirts of Tel Mithryn, southwest of the Sun Stone. However, she is not currently available for traveling services. The silt strider cannot be harmed by any spells or weapons. 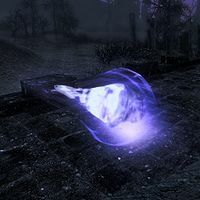 Whispering Spirits are invulnerable wisp-like creatures you can find within the Soul Cairn. Some follow set routes, and some seem to just fly around randomly. You are unable to interact with them yourself in any way, as any attack has no effect on them. Despite this, Bonemen, Wrathmen, and Mistmen will all give chase to these creatures, either by running after and trying to attack them, or using ranged attacks. This can provide both a humorous sight, or a helpful distraction if you come across already present enemies. They only chase the spirits before detecting you, after which they will continue after the spirit for a short time before turning their attention to you. Note that unlike other passive creatures listed here, whispering spirits are technically true creatures, as opposed to animated activators. They are similar to wisps, hostile ethereal monsters which accompany wispmothers. 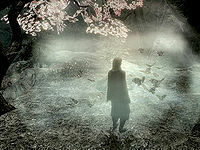 The name "Whispering Spirit" is taken from the game's data files, as the creature's name is never seen in game. Dead hawks are not properly cleaned up during cell resets because they have no delete script. 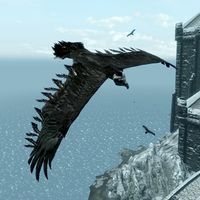 This bug is fixed by version 1.3.0 of the Unofficial Skyrim Patch. The Abecean Longfin activator is misspelled "Abacean Longfin". 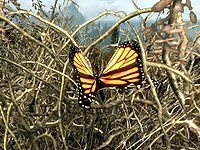 This bug is fixed by the Unofficial Skyrim Patch. This page was last modified on 19 June 2017, at 18:20.